So here I am talking about Romantic Suspense. I was rummaging in my brain for profound topics to write about and I wondered why I even like RS. I read across genres cause after all, a good story is a good story. But, Romantic Suspense/Thriller is my absolute favorite. Do early life events form what we like as adults as some head doctors suggest? 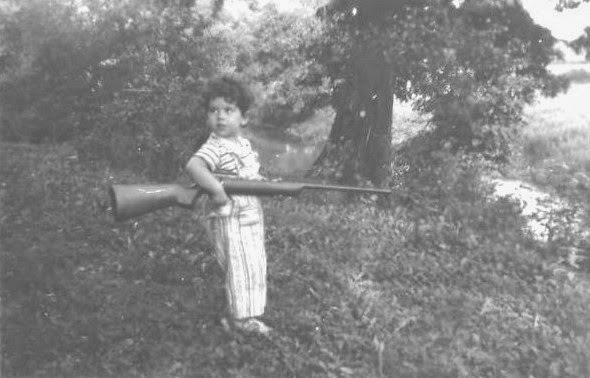 Did having a .22 at an early age or, wearing a double holster and cap pistols while playing with dolls (yes I did do that) really cause this? Were people who like SiFi abducted by the little gray/green aliens? Or, are they from a far flung planet? To like paranormal did you have to live in a haunted house and be chased by shadow figures? I don’t want to think about how a love of zombies comes about. I don’t know. What I do know is I love reading. Well, I don’t exactly read, I listen to audio books because of vision problems. Books are my joy. Books have saved my sanity. I made a list of what I like and expect in a book. I want to be thrilled and chilled by the story but, I do like my warm fuzzies. I want characters to grow and change. I want to take that journey with the characters. I want to be so drawn in I get a bruise where the evil doer hits the heroine. I want to see that brickafritzy evil doer get thumped in the end. I most definitely want the romance there. Mind you I don’t get all wrapped up in a definition of what love or romance is. If the romance drives the story or not. If there’s a loving relationship between two characters and the author conveys it well, I figure its romance and I’m good. In my reading world that relationship draws me in allowing me to connect with the characters. Allows me to root for them to not only get the bad guy but have a happy ever after. I can take a look at the authors list on this page and find that in their stories. Which I have. I do have one complaint, I need more time for books. There are soooo many on my TBR list. BTW, another reason I listen to my books is so I can do stuff while I get my book fix. I went through my recently read books list and I noticed something. There is a trend among the male Suspense/Thriller authors I enjoy to include an underlying romance. And, they are getting better at writing those ‘love’ scenes. Is it because they’ve acknowledged romance sells, or, are they using it to deepen their characters? Dunno, I say with a grin and wiggle of my eyebrows. All I know is I like it. In one series by a male author, I was totally surprised by the tender romance of the particularly hardboiled character. Even though it ended with them separating, IMO it was romance. Months after I read the book I still think of it. Have you read Stephen King’s 11-22-63? There is a romance I knew was doomed from the beginning but dang it, it was so sweet and tender I kept rooting for them. Yes I did say Stephen King. Conclusion to my rambling? Romance enhances my reading pleasure. I love books. Love talking about books. Yours, mine, somebody else’s. Chat with me. Tell my why you enjoy suspense books. What romance in a Suspense book has touched you? Rita writes Romantic Suspense/Thriller with Military Heroines. Extraordinary women and the men they love. Marine Major Honey Thornton is nobody’s fool, so when she’s brought in for an off-the-books mission by a manipulative two-star general, she has to wonder why. When it turns out Honey’s mission is to investigate a military contractor tied to the recent kidnappings of innocent children, she signs on immediately. Little did she know one of the first people she’d have to question was her sometime lover, Jack O’Brien. Jack O’Brien left the CIA bitter and disillusioned and now hires himself out as a contract spy. When his brother and sister-in-law are mysteriously killed and the young daughter they left behind is targeted for kidnapping, he smells a cover-up and goes underground to find out who’s behind it all. Not sure who he can trust, Jack refuses to answer Honey’s questions and tensions flare. With suspicion flaring on all sides and passion burning between them, Jack and Honey have to decide whether they can trust each other and bring down the people responsible, no matter how high up the chain of command it goes. Because when you’re navigating the murky political waters of the Pentagon, the CIA, and private armies, it’s hard to know who’s lying to your face, who stands with you, and who’ll stab you in the back. In the end the only thing you can trust is what you know in your heart. Oh my God, that picture of you with that enormous rifle is adorable! You're so tiny! It's no wonder you love RS and write about military heroines. And you do it so well. Thank you Ana. One of my earliest memories is going dove hunting with my father and uncles.